Legendary game designer Friedeman Friese (Power Grid, Friday) is at it again with his most high-concept title yet: 504. Inside this box, stuffed to the brim with components, are nine distinct game modules, any three of which can be combined to create a fully-functional and unique board game. If you can re-locate the portion of your brain you left in high school statistics class, you'll recall 9 multiplied by 8 and 7 brings you to (all together now) 504! The verdict on this one is going to be out for a long time. Even Friese himself hasn't played all five hundred and four variations! But the buzz surrounding this title at BGG.CON was undeniably hot, and as that statistics teacher is likely to remind you, the law of averages dictates there should be at least a few gems tucked away in this box. 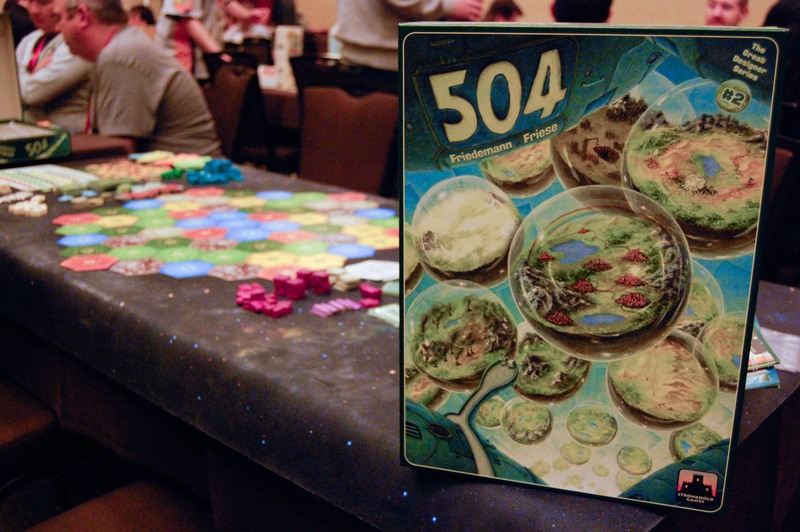 504 was sold in pre-release at BGG.CON, with an official wide release date of November 25th.